Charles H. “Bud” Soder, 88, of Camp Hill, formerly of Boalsburg, passed away on Sunday, February 3, 2019 at Holy Spirit Hospital. He retired after 35 years as Material Control Supervisor at Raytheon. He was a Staff Sargent in the Air Force during the Korean War, from 1952-1956. He was a member of American Legion Post 245. In 1950 he was selected to try out for the short stop position with the New York Giants. Bud was a dedicated husband and father. 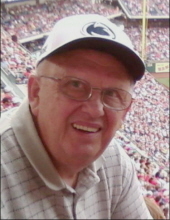 He enjoyed his family, Penn State Athletics, Pittsburgh pro team sports, gardening and musical concerts. He was born December 14, 1930, in Grassflat, to the late Carl H. and Lydia (Lapps) Soder. He is survived by his wife, Ann Louise Soder; two daughters, Lori S. Bauer (Jon) of Camp Hill, and Susan E. Soder of Mechanicsburg; two brothers, Norman of San Antonio, TX, and Ronald of Mechanicsburg. In lieu of flowers, the family is requesting memorial contributions be sent to either: American Heart/Stroke Association (heart.org/en), 4250 Crums Mill Rd., Suite 100, Harrisburg, PA 17112, or Forest Baptist Church, 3847 Winburne Munson Rd., Winburne, PA 16858. To send flowers or a remembrance gift to the family of Charles H. "Bud" Soder, please visit our Tribute Store. "Email Address" would like to share the life celebration of Charles H. "Bud" Soder. Click on the "link" to go to share a favorite memory or leave a condolence message for the family.